We’ve been writing a lot about the Westside Subway Extension in recent weeks, but I wanted to pass along some good news about a related project, the Regional Connector. The draft environmental impact study/report for the Regional Connector project is expected to be released later this summer or early this fall. That’s a big step because the draft study is a looooong document that analyzes all the small and big elements of the project. That includes whether the project is built at street level or underground (many members of the downtown community support the underground alternative, btw), the location of stations and construction impacts, to name a few. As the name implies, the connector is a two-mile line in downtown L.A. that would tie together the Gold Line, Blue Line and future Expo Line, allowing passengers on all those trains to travel through downtown without having to transfer — saving them precious commuting minutes. In other words, if you’re traveling into downtown on the Blue Line from Long Beach and need to reach the Civic Center area of downtown L.A., you could stay on the Blue Line train. Conversely, passengers on both legs of the Gold Line would no longer need to spend the usual five to 10 minutes (or more, at some hours) at Union Station switching to a bus or the subway to reach the heart of downtown L.A. 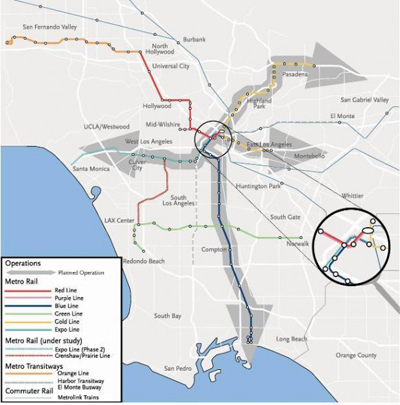 The map shows the operating plan being considered in which trains would run from Santa Monica to East L.A. and from Long Beach to Azusa. Once the draft study is released, public meetings will be held to help explain the document to the public, which will then have the chance to officially comment on the study. Also, as part of the study, the Metro staff that are planning the project will recommend a “locally preferred alternative” — what they think should get built and why. Those decisions will ultimately be up to the Board of Directors of Metro, the 13-member body that are the deciders in these parts. Once the Board of Directors vote, the final environmental document for the project will begin, as well as the engineering and design work that is a prelude to construction. It should be an interesting next few months, because the draft environmental studies for both the Westside subway and the connector projects should be released about the same time. It’s not quite as exciting as seeing actual dirt getting moved, but in my view it’s a major step forward — the next best thing. Under Metro’s long-range plan, the Regional Connector would open in 2019. There is a possibility — emphasis on that word — that date could be advanced if the 30/10 Initiative to accelerate construction gets traction in Washington. As of now, the connector project will receive some funding from the Measure R sales tax increase approved by voters in 2008. Metro is also negotiating federal New Starts funding with the Federal Transit Administration for both the connector and subway projects.